Around this time last year I interviewed José Serebrier (read the interview here). He had just come back from recording Glazunov symphonies in Glasgow, and was about to set off for Poole to record some of his own music. One of the Glazunov works he had just recorded was the composer’s 1st Symphony, written when he was a teenager, and one of the works he was about to record was his 1st Symphony, written when he too was a teenager. When I asked he denied that the comparison was particularly meaningful, saying that Glazunov’s voice appears in this 1st Symphony fully mature, with no need for further development. 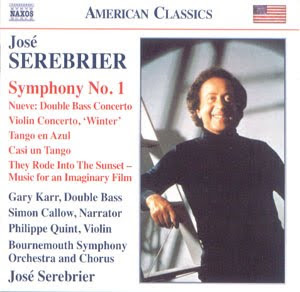 Having now heard Serebrier’s own 1st Symphony, I realise that this was just modesty, because this work also demonstrates a completely mature musical outlook despite its composer’s youth. It is a work of energy and passion. His mastery of orchestration at such a young age is remarkabe, but significantly, is not the overriding message of the work, for this is much more than a technical exercise or tryout of the genre. I think it is appropriate that Naxos have released the disc as part of their ‘American Classics’ range, because it fits squarely into the mid-20th century American symphonic tradition. There is plenty of Rachmaninov in there, something that the composer would attribute to his Slavic roots, but there is also an admirable sense of discipline and restraint, as if neo-classicism has influenced its scale and structure, but without affecting its post-Romantic style. Serebrier has said that as a young composer, he wrote single movement works because he felt that multi-movement forms had become redundant. In a sense, that view seems quite arbitrary considering how many traditional stylistic features his music retains from the 19th century. But somehow he always manages to avoid cliché or parody. Perhaps his diverse roots are to thank: he was born and brought up in Uruguay to Polish and Russian parents before moving to the US to study. Like many new world composers, his work takes elements of European musical traditions and reconfigures them. It’s this reconfiguration that makes the work distinctive, and surprising too. I get the impression (and I may be wrong) that the music comes naturally to Serebrier and that he doesn’t have to search too hard for inspiration. It was the 1st Symphony that put Serebrier on the map when Stokowski premiered and later recorded the work. The Stokowski recording has recently been reissued, and although I haven’t had a chance to hear it, I can imagine that this is just the sort of music Stokowski would have loved. Perhaps the orchestration is a little more modest than he would have written himself, but the passionate, full tutti textures, the innovative percussion, the sweeping string lines – it’s all very Stokowskiesque. The Double Bass Concerto ‘Nueve’ is another story entirely. It is a much more experimental work, with offstage players, a choir, jazz breaks and even a text for the soloist to recite. Serebrier describes the work as being of its time (1971), and certainly all these ideas were in the process of becoming common currency then. In fact, the work is more lyrical and more approachable than its description suggests. The move from Copland-like symphonism to Berio-like experimentalism doesn’t significantly affect the overall style of the music. Somehow, and this is all the more impressive given the choice of solo instrument, the work functions as a traditional concerto. The performance of all the works on the disc is excellent, as is the sound, but the engineers have been faced with some unusual challenges in the Double Bass Concerto. Simon Callow (a close friend of the composer) reads the text instead of the soloist, but you don’t get the impression that they are sharing a stage. Perhaps they are, but Callow’s voice has been so isolated from the acoustic that it sounds like he is in the control room. An impressive performance here from soloist Gary Carr, the work’s dedicatee. He is an older man than he was in 1971, but you wouldn’t know it from his agility around the finger board and his impressive projection. Philippe Quint is also impressive as the soloist in the following Violin Concerto ‘Winter’. If I’ve less to say about this piece, it is because it doesn’t go in for any of the theatrics of the Double Bass Concerto. It’s still a well written work though, but it is one of those more downbeat and diminutive concertante works that you can’t imagine anybody ever having occasion to programme. The rest of the disc is essentially filler, two tangos and an orphaned piece of film music. Interestingly, though, these are all recent works, yet are stylistically and technically very similar to Serebrier’s earlier work. Excellent performances throughout from the Bournemouth Symphony Orchestra. I have always thought that they are an ensemble who need inspiring leadership to bring out their best, and Serebrier clearly has what it takes to get top quality music making from them. I was reading an interview today with Klaus Heymann, CEO of Naxos (read it here). He says that orchestral recordings don’t make the company any money because of the production costs, and that they only continue making them for the prestige. With that in mind, this could well be considered an obscure project for label kudos. I think the answer to that paradox is the sheer quality of the result, both of the music being championed and of the production values of the release. They might not break even with this one, but it is more than worthy of all the prestige it attracts.